What does the office of a high growth startup look like? How did you feel when you walked into your office this morning? It’s probably not something you took note of. Think about it the next time you’re walking in. If you’re unhappy too many days in a row, your productivity may drop. Your work could suffer. You may even start looking for jobs elsewhere in a few months. That’s exactly what startups try to avoid by investing in a great office. Startups who experience rapid growth and manage to raise (or make) a large amount of money are willing to go the extra mile to make their office space truly amazing. Here are a few quickly growing startups who took investing in their office space seriously. Thumbtack helps consumers hire experienced professionals to accomplish personal projects (like improving your singing). 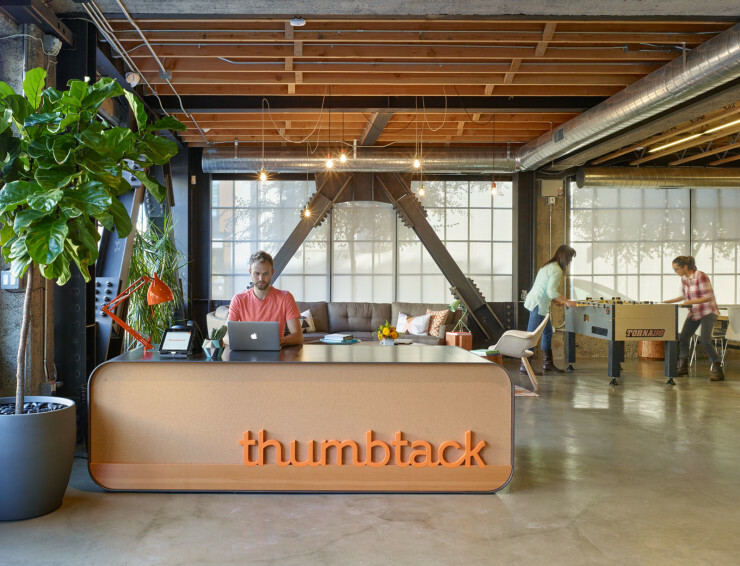 With a 321% headcount growth rate over the past 2 years and $148,200,000 in funding, Thumbtack took building a beautiful, 23,000 square foot office in SoMa, San Francisco, CA seriously. Of all the companies in this article, Postmates has the most staggering employee growth. In the past 2 years, their headcount has grown by 2,038%. Delivering anything in your city on-demand, 24/7, PostMates is now available in 15 states, but they call California home. Their digs in San Francisco that host most of their 385 employees aren’t too shabby. Now, San Francisco isn’t the only city with beautiful startup office space. SoundCloud, the online community of artists, bands, podcasters and creators of music & audio have bucked the trend. They have offices all over the world to house their 392+ employees, but over $120,000,000 in funding and a 143% headcount growth rate over the past 2 years allowed them to splurge on this beautiful New York City office. Boasting a 177% headcount growth rate over the past 2 years, NewsCred, the leading content marketing software, has built a beautiful homebase in NoMad, New York, New York for its 205+ employees. Here’s the type of space you can afford with $46,750,000 from great investors like FirstMark Capital and Greycroft Partners. It may be difficult to tie the beauty of an office directly to the success of a company, but we have a feeling these companies are on to something.